If you are interested in contesting, N1MM+ is a fine choice. However, for general purpose logging like casual QSOs and dxing, I would consider a different logger. Treasurer, Quarter Century Wireless Association, Inc.
Revive my CW speed with similar hams. The exchange is RST, state, name, and rig. The electrons, protons and ionizing radiation are raining on the Earth right now producing an HF radio blackout. Couldn't work WES on Saturday, so dedicated Sunday for my WES. Got 3 WES contacts in the log before the bands went dead. So much for this one. Not bad for the so-called "quiet sun." This is on eBay now. After our shipping "experiment" I will consider adding international shipping to the ebay listing. Here is an ebay link. The only difference is that I used paracord instead of fiberglass spreader rods. The paracord is strung up like a bix X anchored at four corners of the attic. The antenna wires are attached to it so it really looks like a big spider web up there. Also, my terminal/balun box is different. The antenna covers approx 10 sq ft. It's in the attic of a wood frame house, about 30 ft above ground. I trimmed the antenna to length with the aid of a noise bridge. There are five interacting dipoles to cut but the process is not all that finicky. Using an antenna analyzer would be quicker but the noise bridge did the job ok.
From what I see the MFJ version has some good comments. Performance wise, from my experience, I'd be willing to pay a couple of hundred bux for the commercial version. Antenna covers five bands, 10 thru 20. Why does anybody need to be a member of "CW Ops Academy" to learn CW? Why do you need to copy 25 WPM in you head to be considered a good CW op? If you can send and copy 5 WPM or better get on the air and start making contacts. How did we ever do it before the internet age? Oh, I remember, we jumped into the pool and learned to swim. we put out a book “Memories of the Brasspounders”. I recorded stories at meetings, asked for contributions, typed them all up and produced a book for our 175 members. Document "Memories of the Brasspounders"
I have just heard back from Lavina Shaw that the still living authors of the stories in the document she published titled, "Memories of the Brasspounders" have okayed its release to the public. So it is attached to this email. I will also put it up in the files section of slowspeedwire. Things look bad for the next few days. Wow! What a week for solar activity. Although the solar cycle trend is down over the past few years and moving toward a solar minimum around the year 2020, we will still see notable upticks in activity, such as this week's surprising events. reported a G-1 Class geomagnetic storm. Planetary A index was 59. The following day Spaceweather.com reported geomagnetic unrest with a planetary A index of 19. Planetary A index was 26 on September 2 when Spaceweather.com reported sunspot group AR2674 "rapidly growing, increasing in both area and sunspot count." "As the sunspot grows, its magnetic field is becoming unstable, posing a threat for M-class solar flares." Planetary A index was 9 on September 3, when Spaceweather.com reported two huge sunspot groups facing Earth. "Behemoth AR2674 has been growing for days, while newcomer AR2673 has suddenly quadrupled in size, with multiple dark cores breaching the surface of the Sun in just the past 24 hours. On September 4, the planetary A index was 18, and Spaceweather.com reported: "Huge sunspot AR2673, which materialized with shocking speed over the weekend, is seething with activity. We also saw the largest solar flare in over a decade launch Thursday night. 90, 85 and 80 on October 6-10, 85 on October 11-14, 88 on October 15, 92 on October 16-18, and 95, 98, 100, 105 and 110 on October 19-23. Predicted planetary A index is 30 and 10 on September 9-10, 8 on September 11-12, then 28, 30, 20, 25 and 12 on September 13-17, 5 on September 18-19, 8 on September 20, 5 on September 21-22, then 8, 5, 8 and 5 on September 23-26, 20 on September 27-29, then 12, 10, 8 and 5 on September 30 through October 3, 15 on October 4-5, 8 on October 6, 5 on October 7-9, 25 on October 10-12 then 20 and 10 on October 13-14, 5 on October 15-16, then 8, 5, 5, 8, 5, 8 and 5 on October 17-23. "Remark: - Parenthesis means lower probability of activity enhancement and/or lower reliability of prediction. "F.K. Janda, OK1HH Czech Propagation Interested Group"
"Do not believe modern-day short-cut internet-gimmicks such as this (he included a reference to an online tool predicting propagation titled "HF Conditions"). 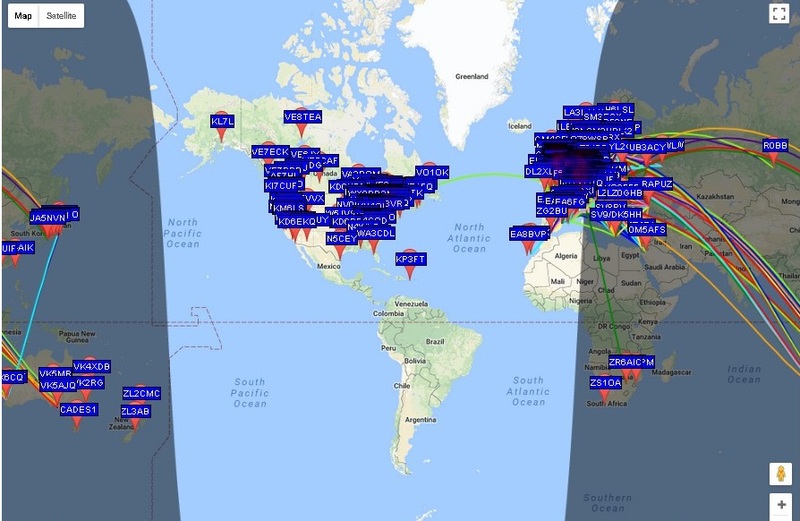 "Have a listen to the propagation beacons, tune around the bands! Remember there is NO SUCH THING generally speaking as a GLOBAL HF one-size-fits-all-situation in spite of the modern trend to paint that picture into their systems. Part of the world is in darkness, part in light. There are many grey areas. The K index varies from location to location. East-West and North-South paths are affected differently by events. "Nor should we rely on advanced real-time programs such as VOAProp by G4ILO. While useful, these also give sometimes wildly false readings. For example, as I write this, bands including 10m are having great propagation to all of America and to Asia, and perhaps to other places too, while showing that even with 4kW and a big high up Yagi at most S1 signals from a few isolated places north of Australia would be possible. NOT. I just need to tune in to 28200 to hear all the beacons coming in so nice and clear and they are running 100W to simple Ground Plane antennas. "Again we may be tempted to take that at face value. 20-10m has not been open much from VK in recent times with very low solar flux and no sunspots at times. However right now, 10m is open. 12m is open, 15, 17 and 20m. Little activity but the beacons are clear, and Costa Rica booming in on SSB on 20m even though the local time here is high noon with the Sun high in the sky. we see that in Australia and New Zealand conditions are actually enhanced. we see that conditions in most of the world are ENHANCED, most of the rest is NORMAL and only a few areas in parts of the Central Pacific and near to the North Pole (parts of Canada, part of Greenland) and northern Siberia are depressed. So why is there so much alarm and DEPRESSED shown as a 'one size fits all' on simple condensed gimmicks? Well, it is true for those few parts of the world. And somewhere the K index is indeed 8, somewhere it is worse, somewhere better. "Bear in mind that while over today and tomorrow there is a possibility or even a probability of short wave fade-outs (not worldwide but generally on the Sun side of the earth) but the Solar Activity being high to very high means that when there is not a fadeout conditions are most likely to be enhanced! We should be SO HAPPY that solar flux is now well above 100, as that means HF openings occur on higher bands more often. With the current predicament of those few radio amateurs who are not hampered by various distractions, the LOCAL NOISE levels are prohibitive on lower frequencies. When bands above 20m open up, we should not be scared off by a glance at the RED/POOR prediction and miss out on all the easy DX with simple antennas and low noise to be had while the higher HF bands are wide open. Let us not forget the IBP beacons, and to tune around and call CQ even when predictions would encourage you do to otherwise. Lou makes some excellent points. The various propagation models used in the tools for predicting HF success are based on mean predicted sunspot numbers for the month, and cannot predict real time HF propagation. On September 7, Mark Lunday, WD4ELG in North Carolina reported great propagation to South America on 10 meters using the new FT8 mode. 10 Meters was back Sunday afternoon August 27 for intercontinental DX. I had been working the Hawaiian QSO Party on 15 and noted spots for Hawaiians on 10. I went to 10... unfortunately did not hear Hawaii but logged WP4JW FK68 on 10 SSB at 2307z followed by LU5XP FF97 Argentina at 2310z. The QSO with WP4JW was probably double hop Es as I saw many Es contacts spotted around this time on 10. The LU contact may have been Es link to TEP. LU5XP was very loud for about 15 minutes then vanished abruptly. HK1MW was spotted via Es to W3, W7 and W0. Stations in Hawaii did work North America on 10 meters August 27, I saw Hawaiians spotted by stations in Florida, Texas, California, Washington State, Oregon and New Mexico. Sunspot numbers for August 31 through September 6, 2017 were 59, 62, 71, 96, 122, 122, and 79, with a mean of 87.3. 10.7 cm flux was 91.9, 93.4, 100, 120.2, 140, 120.5, and 132.9, with a mean of 114.1. Estimated planetary A indices were 31, 19, 26, 9, 18, 12, and 11, with a mean of 18. Estimated mid-latitude A indices were 20, 17, 25, 10, 16, 11, and 18, with a mean of 16.7.
and click on "join".Telegram works on all platforms, different operating systems and mobile phones. We seem to be going through a particularly bad patch, on the sunlit side of the earth. My WSPR 1-watt tx transmits for 2 minutes every half-hour on 30m. I regularly check reception reports on the Internet (at wsprnet.org). My reports stopped coming mid-morning. Naturally, I first checked that the tx was still working, and went outside to see if my antenna was still up. Everything seemed to check out. I then checked wsprnet.org for ALL reports from ALL stations on 30m, and got this map. The continuous coloured lines mark valid reports between stations. All stations reporting in to wsprnet.org are shown, even if they are receiving no signals. You can see that (apart from just 1 transatlantic line) there are no reports between any stations on the sunlit part of the earth, while there are plenty of reports between stations on the dark side of the earth. This is very unusual at this time of the day and year. I checked similar maps on 20m and 40m, with similar results - essentially no reports on the sunlit side of the earth. RBN shows the same effect. Note the: "Wide area blackout of HF ..." at the end of the report. No wonder that the SSN net today had such poor conditions. Comment: Flare originated from Region 2673, currently located just behind the west limb.